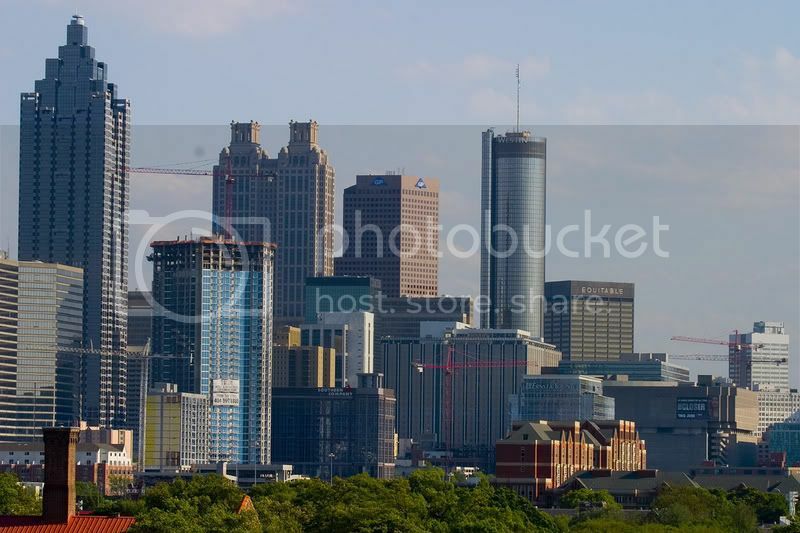 Please use this thread for any news or discussion about any urban developments or projects proposed or going up in the Downtown Atlanta District. Please note that this is a discussion thread for urban developments and projects of all sorts, not just skyscrapers. Information about skyscrapers is by all means welcome because they are a part of an urban environment, but they are not the only part of an urban environment. I can see them right outside my office window and they look finished. I have noticed some sidewalk and landscaping work ongoing, however. My co-workers and I already refer to it as "GSU State Prison". A group of area leaders met recently to brainstorm about big development possibilities downtown. Some of the ideas are big and visionary. Maria Saporta's column has all details. Very exciting, if they can pull it off. There seems to be a growing will to do it. Here's the link. Turning Underground Atlanta into a casino? That's bold. A lot of what was mentioned, like linking up the AUC with GSU and Sweet Auburn with the MLK Dr/Lowery Blvd area, is just common sense. I hope at least those proposals go through. The brightest spot in the article, IMO, was the potential transformation of the Five Points MARTA station. That should have happened yesterday. leasing activity at 55 Allen Plaza has jump-started planning for the next office tower at Allen Plaza. 24 AP will be two blocks south of 55 Allen Plaza and will likely feature 350,000 sf of office space, with a 45,000 to 55,000-sf grocery store and an additional 15,000 sf of retail. Developers continue to plan for 50 Allen Plaza, projected to be 600,000 square feet to 1 million square feet. Is 50 Allen Plaza the tower with the lit up "handle"? It's great that they're including a grocer in this development, another Publix anyone? There are a couple of other Publix's within reasonable walking distance but this will be a HUGE plus for downtown residents. Here's a rendering of the retail at Twelve along Ivan Allen. Also the second phase will start later this year. That would look even better with some awnings. 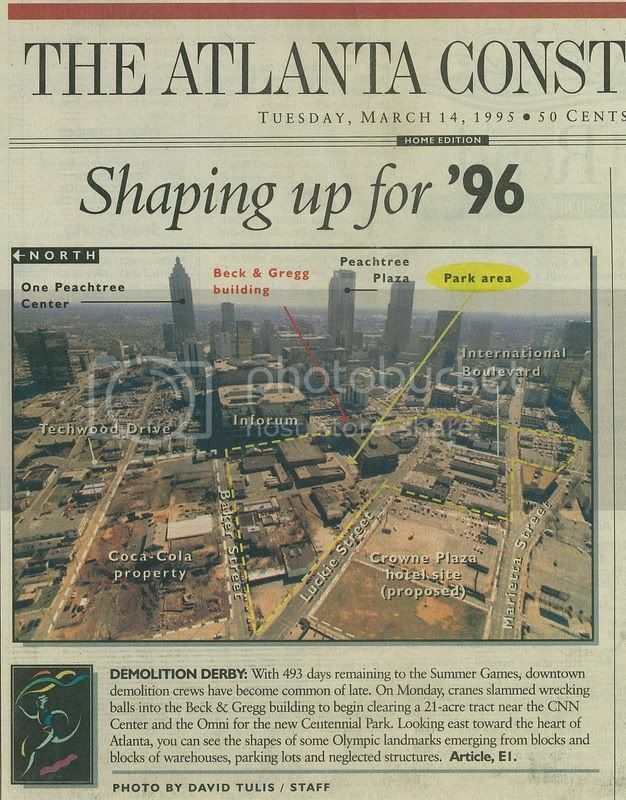 Someone found a pre-olympic AJC and posted it online. It puts into perspective just how much progress has been made in the COP area. It would be great to see a current photo from this same vantage point. Allen Plaza will further enhance this area. Lady Celeste, good to see you again! Thank you very much. Unfortunately I hardly have time to breathe anymore. 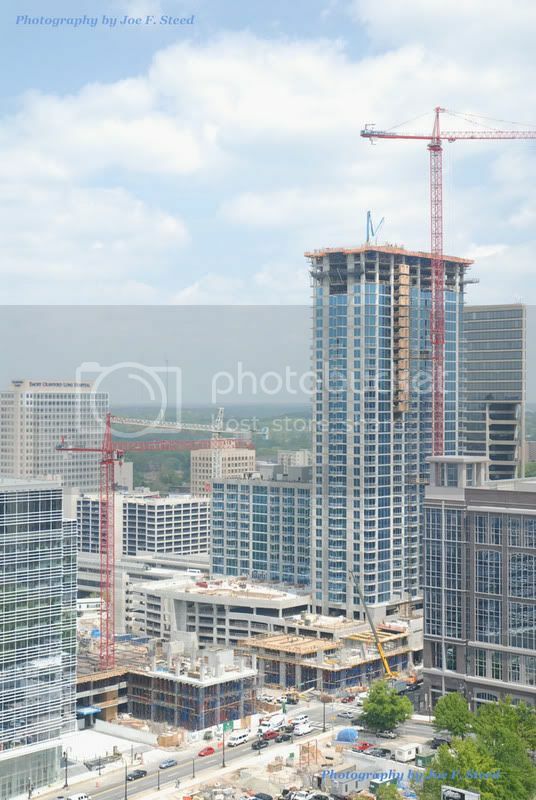 I miss following the development of Atlanta though. I fully agree. When the Five Points station opened in1980, OMG, I thought that this square cement wall in the middle of the city was the most unattractive thing I had ever, ever seen. Then top it off with the ghetto look going on south of the station and you have the makings of a disaster. When I walked into the 2 Peachtree Tower to use the ATM, the African-American security guard said, "Welcome to the Getto!! ", OMG, I was so shocked. Then I learned that the Westin Peachtree Plaza Hotel staff tells people not to go to Underground, they steer the tourist to Atlantic Station, Lenox, and Phipps. Yes, this would be wonderful for an area I believe has so much potential with all of the young people in the student population. Yes, merge both Universities together, for a wonderful, and very cultural experience. The ABC reports that the developers that recently opened two new restaurants in the former Planet Hollywood are planning to convert the Carnegie building from office space to a boutique hotel. They also mention plans for another boutique hotel on Marietta st. It will be a Hotel Indigo. Planet Hollywood's gone? That's news to me. Next time I'm in Atlanta, I will have to make it a priority to try to hang out downtown (aside from the aquarium and COP).